T Maclntyre/Colton Route, Grandes Jorasses, France of autumn or winter the rockfall is stilled, so it is reasonably safe. When this climb was first done in (975, it marked the beginning of an era of climbers looking for difficult seasonal ice on the great Alpine faces. 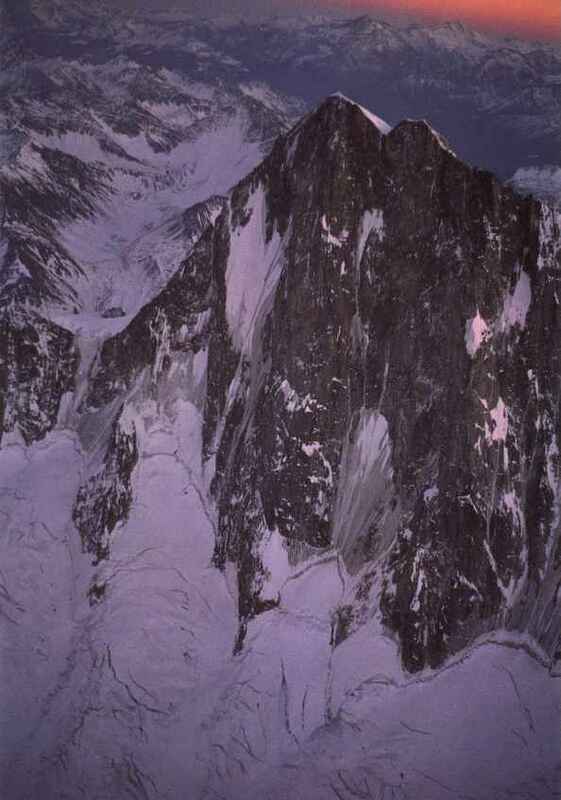 It remains one of the most challenging routes of this nature, the enduring signature of two great English climbers-—Alex Maclntyre and Nick Colton. Season: October through April, depending on the particular year Comments: To my knowledge, the Maclntyre/Colton has not been climbed completely free. 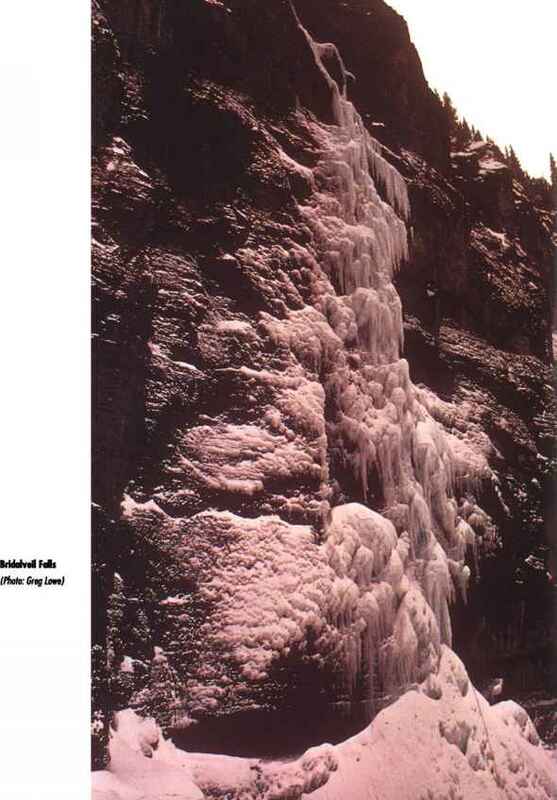 The pitch above the small ice field that bisects the two runnels in the middle of the route is usually pure rock and has required some aid from pitons. Perhaps, in good conditions, you can climb thin ice on the face to the left. Another option might be to follow an ice-filled, foot-wide crack that rises from an upper-right-hand corner of the central ice field and connects with the upper ice field. This crack has been climbed by Jean-Marc Boivin as part of a route called Extreme Dream and is probably about M5 or harder. Approach: Take the train from Chamonix to Montenvers and walk or ski up the Mer de Glace to the Lescheaux Hut on the left bank of the Lescheaux Glacier. Alternatively, you can take the tdiphtriqut to the Aiguille du Midi and ski down the Mer de Glace to its junction with the Lescheaux Glacier, In either case, the Lescheaux Hut is your base for the climb, and reaching it will take several hours. In the morning it is another hour or so up the glacier to the base of the climb. 235 T Super Couloir Direct, Mont Blanc du Tacul, France up and left. 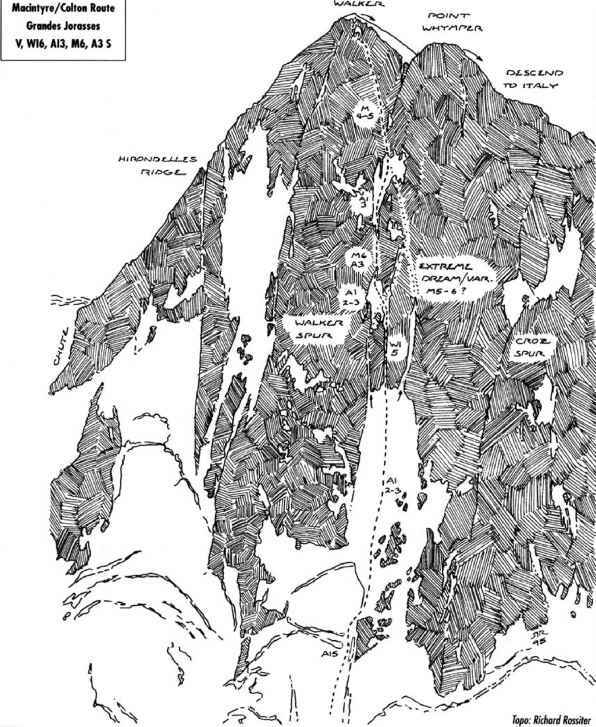 An intricate rock pitch with some aid and a tension traverse left (AI2 or 3, M5) lead to a belay at the very bottom right side of the upper gully coming down from the left side of the highest ice field. Another moderately difficult pitch on rather steep ice (Wl4) leads to four or five pitches of lower-angle climbing (50° to 55°, AI2), which brings you to the rim of the upper ice field below the central chimneylike depression in the final rock headwall. Eight pitches of M4 to 5 mixed climbing follow this depression to a junction with the last pitch of the Walker Spur (M5 in winter conditions), and then you top out on the very summit. Descent: The long descent from the Walker Spur is down the south (Italian) side of the mountain. Begin by walking to Point Whymper, the slightly lower point several hundred feet west of Point Walker. Follow a rib of broken rock and ice directly south until you can cross the bergschrund on the South Face ice field onto a glacier shelf. Cross the shelf to the right (facing the valley), underneath some ice cliffs. At the far end of the shelf is another rocky rib. Ascend it a short distance above the shelf to a fairly prominent notch. From there a rappel deposits you in a narrow, glacier-filled basin. Cross it down and right to a rocky prominence, which you descend until you find rappel anchors. Make a rappel or two and then continue down as directly as possible. Eventually you will connect with a trail leading to the little Italian village above Courmayeur, where it is possible to buy a well-deserved meal and a bottle of wine at one of several cozy restaurants. (Don't forget your passport and some money!) From here you can catch a bus back through the tunnel to Chamonix.